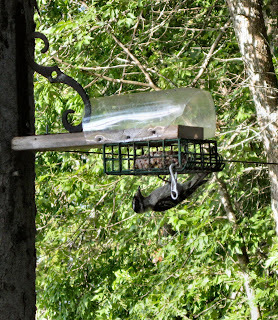 A squirrel-and raven-proof suet feeder. . .so far! We were buying suet by the wagon-load for a while there, what with the constant stream of uninvited, selfish, messy diners. We had the usual cage suet feeders that attached flat against the trees, and every day they were emptied and needed filling. The squirrels, the black birds, and the pileated woodpeckers made sure there was nothing left for the smaller suet-loving birds, who were hovering nearby licking their chops. The metal clamp holds the feeder shut and is easy to open when it comes time to fill it again--which isn't nearly as often any more. The small birds love it and the big, aggressive birds--and squirrels--hate it. That's an added bonus, don't you think?